Many discussions are popping up on Quora about how to effectively collect customer feedback in recent couple of years. Interestingly, the questions are mainly coming from the Software industry. As software move from on-premise to online self-service, the disconnection between companies and their customers started growing. Online web products have no salesman to introduce the features. When customers have difficulty using the product it is also less direct to find support than just dropping in a store to demand for a new one. Yet this gap between customers and online businesses makes it all more important for websites to offer a channel to allow customer feedback. No feedback or too much feedback. Depending on the situation – scenario 1 (no feedback) or scenario 2 (too much feedback) – you should set different goals and use separate strategies in reaching that goal. Getting feedback for a newly launched (or even a product in closed alpha/beta) isn’t that easy, as there will still be bugs and failures of your product. But having no finished product, and no customers you can ask for feedback isn’t as bad as it may sound. On the contrary, this is the time which offers you a chance to build some strong and sustainable relationships. The earlier you include potential users into your product development, the less likely it will be that your software fails. Evaluating, testing, and collecting customer feedback is relevant in every development step. So, it can be helpful to build relationships early. Of course, you might ask: OK, and where can I get those first customers? When thinking about whom of your customers to ask, you’ll think about the following funnel. 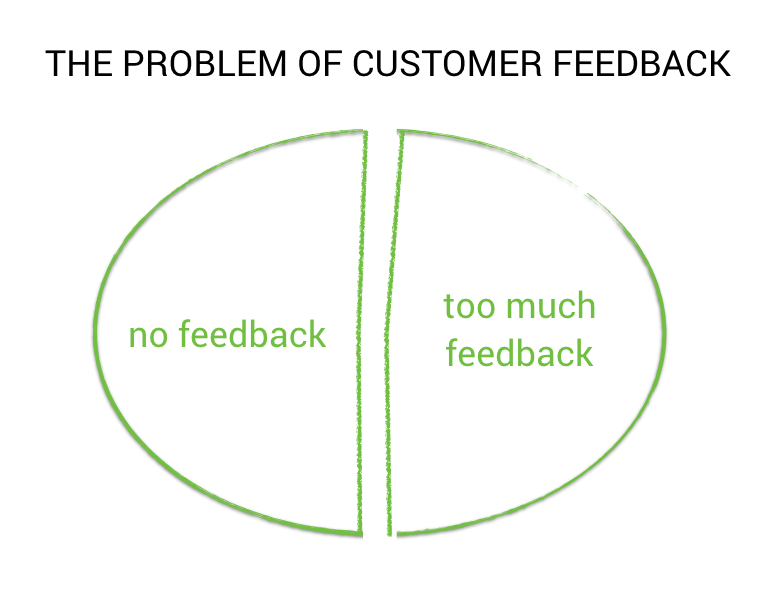 The more customers you have, the better the chances that you’ll find the customers who are willing to give feedback, and then you actually give feedback. If you don’t get a lot of feedback, you can either find ways to bring more customers into this funnel, or you can increase conversion rates through this funnel (e.g. 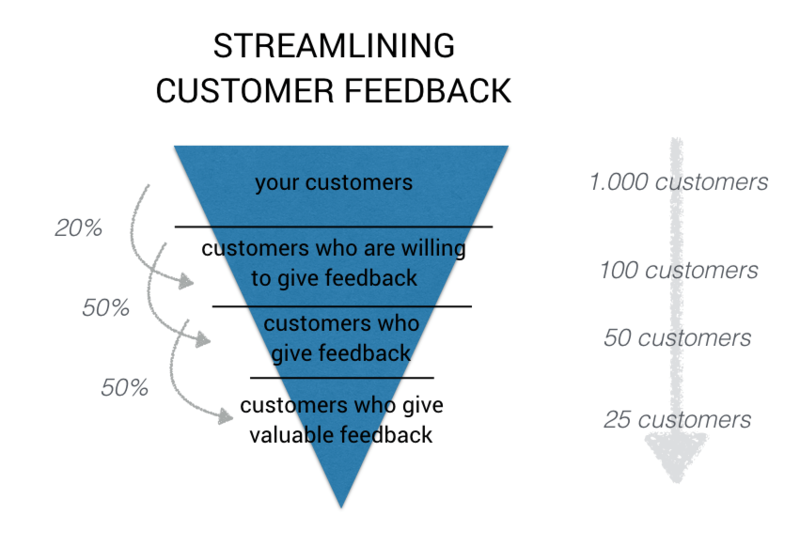 you make it easier for customers who are willing to give feedback to actually give feedback). As we now have a clear understanding of how to attract the right customers (not everyone would be a good fit for feedback), we need to think about ways on how to engage with them. As you may have experienced, not all feedback are “helpful”. Some feedback are vague and inaccurate, which most likely reflects the customers’ knowledge of your product. Some feedback are very aggressive but fails to pinpoint the exact problem. The best feedback is found at the time your customers are using your product. Think of it as watching a movie with your friends: if you go to the cinema together you would laugh at the same time, shed tear at the same scene. But if you were just discussing the movie over coffee break a day after watching it separately at home, you might not get why he is having such reaction or why she is so moved by another character. It’s just not the same. Get your customers to share feedback in the moment. This will immensely improve the accuracy and value of the feedback. 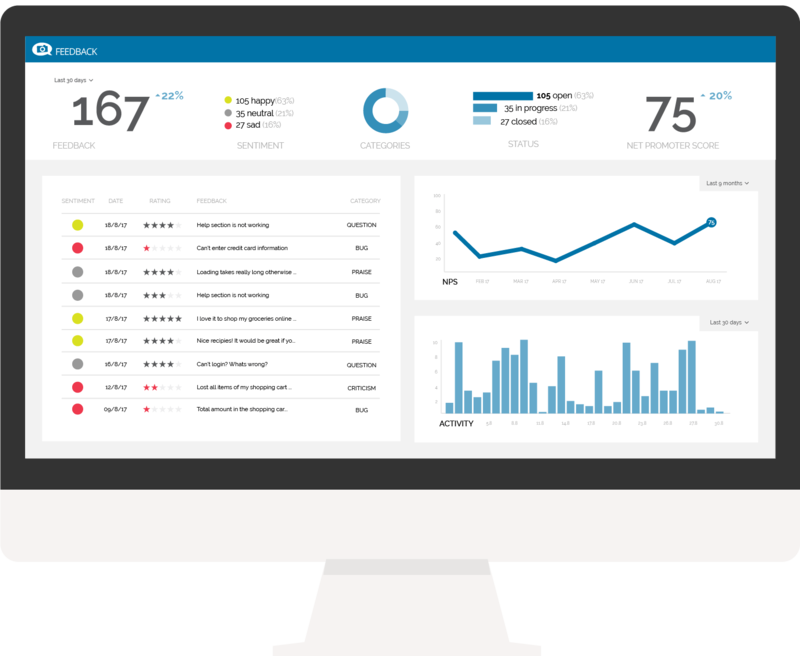 Implement a customer feedback solution inside your product, and enable your users to easily leave feedback at the time the encounter problems or troubles. The feedback and information get even more powerful when you actually get qualitative feedback as well. Going back to the movie reference, a 8/10 review says so much less than a critic’s 5 lines remark. Usersnap is a responsive visual feedback tool made for web applications, websites and other software products. You can simply embed the Usersnap feedback button inside your application which allows your users to leave feedback in the form of annotated screenshots. Usersnap can also help you collect both ratings/NPS/CSAT scores and follow-up customers to get written feedback. This will provide you a wide range of data to analyze and truly understand what makes your customers happy and why they like using your product. Why should you give such a feedback tool a try? To learn more about collecting customer feedback on-site, please visit this page here, You can also talk to one of our customer feedback experts here. One of the best ways to get in-depth customer feedback in an efficient way is to simply ask them in person. When you have a customer’s email address, you have the opportunity to send out a personal email asking a single question. You can ask about challenges and problems, or about features your customer might like to see. Make sure to keep the email personal and try to avoid marketing speech. Try to start a conversation instead. And better make sure you’re replying to emails on time. Arrange a call or interview would be your next step. Often when you treat your customers with care, they go on to become your loyal advocates! Customer surveys are a great way to gather feedback and insights into the life of your customers. 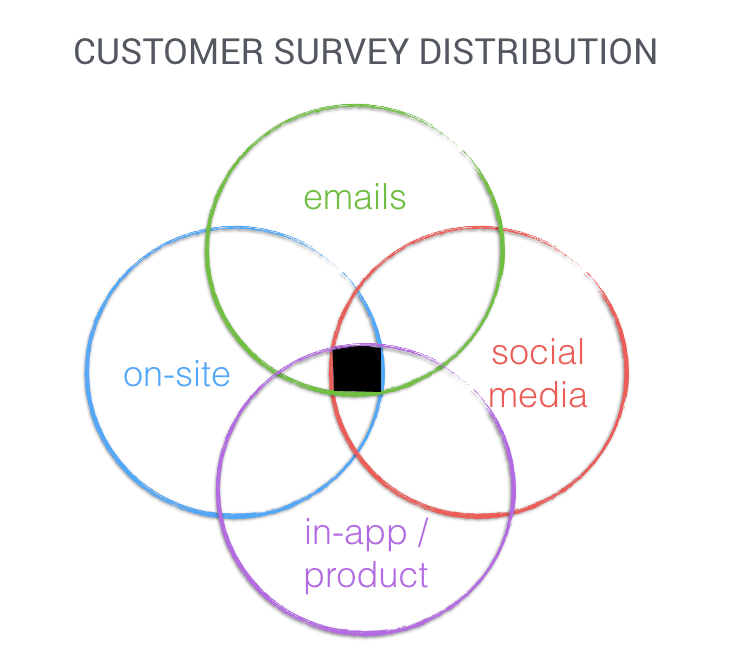 Those customer surveys might pop up in your software product, or you might send out emails asking for participation. There are many options in the market for getting your survey up and running. Usability tests are the costliest form to ask for customer feedback. However, they deliver by far the best and most comprehensive feedback you can get. 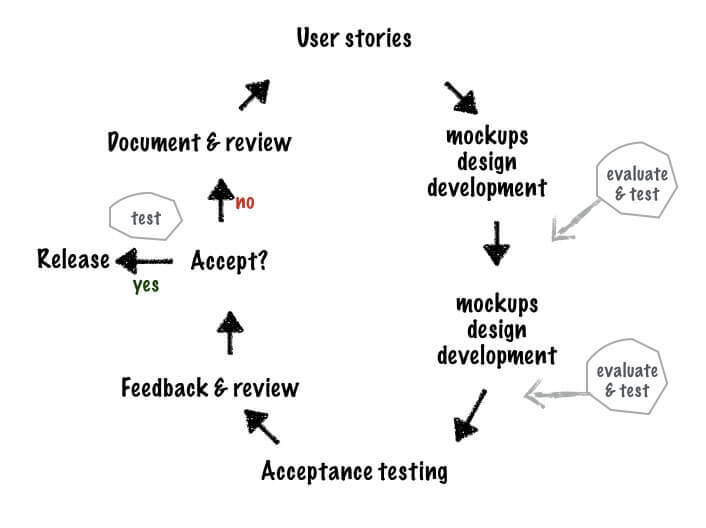 Usability tests can be run during every single project stage. You test first ideas, mockups, prototypes or finished products via usability tests. Usually, these tests are done with a very small and well-selected user group, preferably in an observable environment. If you want to learn more about Usability Testing and User Acceptance Testing, check out the following articles. 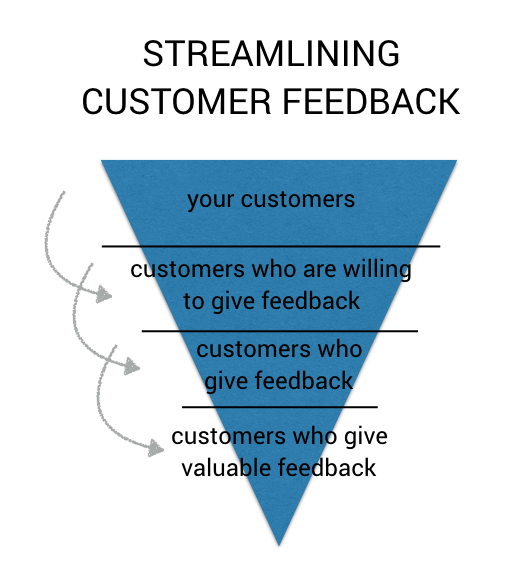 Streamlining your customer feedback isn’t easy. There are a lot of questions you need to answer in advance – What’s your goal? Who’s the best person to ask?. And a lot of feedback channels to consider – How to measure? What approach is scalable? We won’t pretend there is no absolute solution. But we offer customizable plans and flexible feedback widget designs to try to suit different use cases. Most companies lack an in-depth understanding of their customers. That’s why product decisions are often based on lucky guesses or gut feelings. Only your users have the answers. We help you to start listening. Want to schedule a session with one of our customer feedback experts? Or get a free 15-days trial of Usersnap now. Customer feedback is important. But customers have short attention spans. So, how do you overcome this hurdle and get this extremely valuable customer feedback? By creating an easy and seamless experience. There are many options for you to choose in collecting customer feedback. The list below provides short yet comprehensive descriptions for each one.